Opinion of Variants and Textual Criticism. This is the paper delivered to the 1996 SBL meeting in New Orleans, which strongly opposes Kim's early dating of papyrus P46. Griffin shines herein! Dr. Griffin's email address is: bgriffinATavemaria.edu.ni [replace the AT with the @ symbol]. An appendix from Mr. Dykes' abandoned effort on First Corinthians. Instead of avoiding the reality of variants, I suggest believers USE them. Good reading. copied/borrowed from the INTF website. 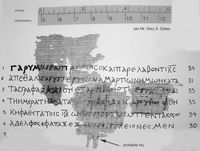 A copy of the additions to the authorized list of NT Greek manuscripts, list maintained in INTF Münster, Germany. Prepared by Volker Krüger of the INTF. Up to papyrus 127, minuscule 2903, uncial 0320, and lectionary L2445. An important correction to the published reconstruction of this NT papyrus (contains I Cor. 14:31-34, and I Cor. 15:3-6). Professor J. D. Thomas made some clear and unmistakable errors. A detailed and educational exposition. Includes several images. Also a reply from Thomas is included, with updates planned. [D. C. Parker, and the edition's editors may also have contributed to the discovered errors]. P.Oxy.LXXII 4844 - - from Papyrology at Oxford's "POxy: Oxyrhynchus Online". Extracted from: New Testament Studies circa 1958. A portion of R. W. Lyon's corrections to C. Tischendorf's collation/transcription of Codex 04. These 6 images show the essential corrections for the New Testament.